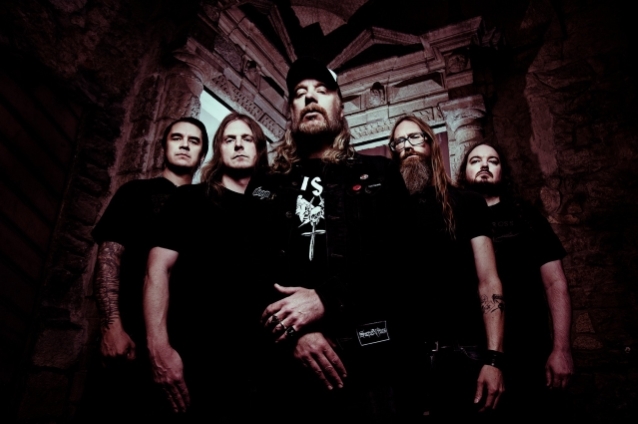 Jorge Fretes of Spain's GoetiaMedia.com conducted an interview with guitarist Martin Larsson of veteran Swedish melodic death metallers AT THE GATES prior to the band's January 18 concert at Razzmatazz in Barcelona. You can listen to the entire chat below. A few excerpts follow (transcribed by BLABBERMOUTH.NET). Martin: "He was a huge part of [the band]. As Tomas [Lindberg, vocals] has said in a lot of interviews, Jonas [Björler, bass] had even more input than before. He wrote if not half of the material, maybe 30, 40 percent of the material for a very long time. This [2018's 'To Drink From The Night Itself'] was a good opportunity for him to step up and prove himself that he can do it without Anders, without his brother. I'm super-happy that he managed." Martin: "Yeah. It's always been like that. Don't take this the wrong way, but 'Slaughter Of The Soul' is just an album. It's one of several albums we've made, it just happened to take on its own life, which is fantastic and we're super grateful for all that it was. But it is one-dimensional and it was designed to be one-dimensional. It came out of a rough period for us. It's like a primal scream of an album. It's just a reaction to the really bad times we had. We wanted to make a classic metal album, but through all the filters we had growing up with the extreme music scene." Martin: "Not really. It's definitely us. It's much AT THE GATES as 'The Red In The Sky [Is Ours]' or 'At War With Reality'. It's all us, but they're different aspects of us. Maybe we'll do another album like that down the line. You never know, but I can say for sure the next album is not going to sound like that. Hopefully, it's a fine balance trying to look forward, bring in new aspects to the sound, but keeping it true to whatever the essence of the band is, also. I think the newest one ['To Drink From The Night Itself'] is a good example of that. We're going to keep trying to do that. Keep the essence, but move forward and simultaneously look backwards." Martin: "It's perfect. It's a good diversity and to me, I don't really care so much about subgenres. It's all metal to me. It's WOLVES, BEHEMOTH or AT THE GATES, it's all metal. It's a good combination and I think we complete each other on this tour." Martin: "Most of the subgenres, whatever it is, are constructs from music journalists. To us, there never was a Gothenburg sound. It was just us being AT THE GATES. The only time I think about this is when people ask me. I don't really have an opinion." Martin: "He seems to be completely out of metal. So, I don't think it's realistic. We all miss him like hell as a friend, but he's not disappeared. He's still there in Gothenburg. He has a twin brother, Jonas. They still have the same relationship as before. But it doesn't seem realistic to play metal with him again, but, as for other [styles of] music, I'm all for it. I think he's just fed up with music altogether. He wants to do something completely different. You never know. I'm sure that at least, him and his brother are going to do something in the future. If it's going to take two months or eight years, you never know. He's got the music in him. He just needs a long rest." "To Drink From The Night Itself" was released last May via Century Media.